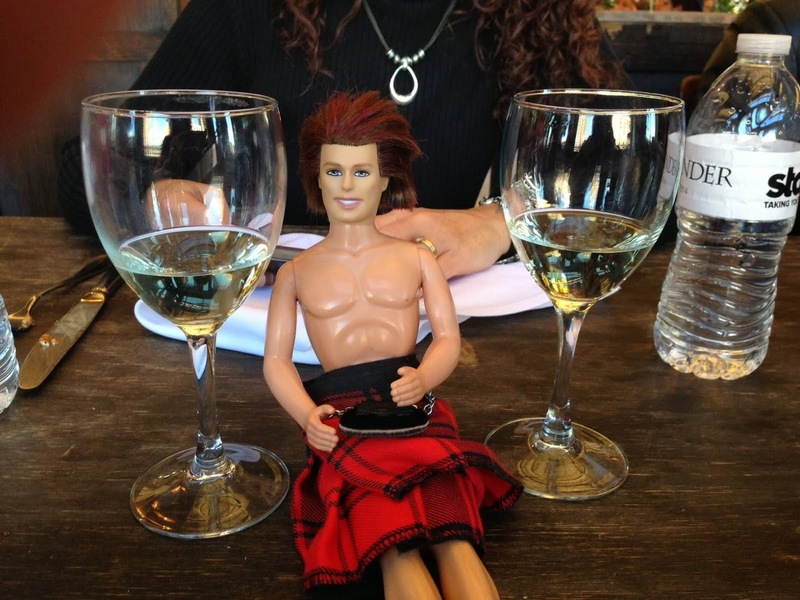 My OUTLANDER Purgatory: Diana Gabaldon in West Virginia: JE SUIS PREST, YA'LL!!!!!!! 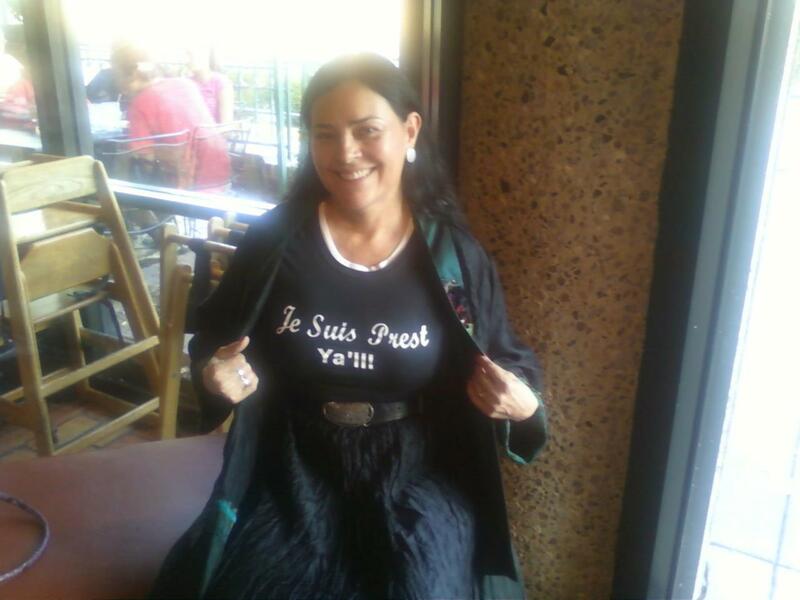 Diana Gabaldon in West Virginia: JE SUIS PREST, YA'LL!!!!!!! Nikki is still gallivanting around West Virginia with Diana (where she was appearing at the West Virginia Book Festival) and WE ARE NOT WORTHY because she sent us this FABU shot of Diana wearing one of THE MOST AWESOME shirts I have EVER seen!!! All in all, it looks like a tremendous time was had by all! But let me tell ya - I hope Diana can get some DOWN TIME soon! All this traveling would make me batty! I want to throw a HUMONGOUS "Thank you!!!" 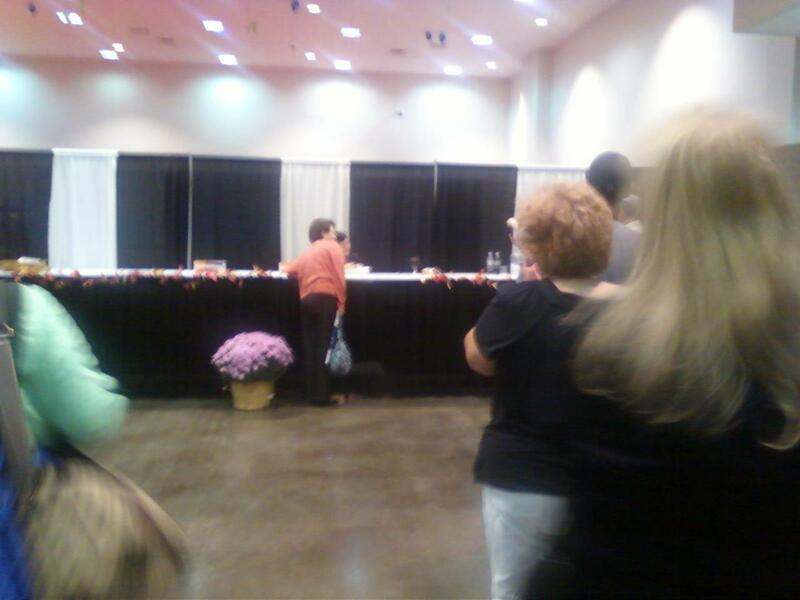 out there to Nikki for being SO INCREDIBLY KIND and sending us these photos. You ROCK, HOOKA!!! I think Jamie would approve of that shirt... (-; Go Diana! I stood in line for almost 2 hours to get to meet her, and the line was still really long after me. Super glad she came to WV. There's a typo on that shirt! LOL!! That's hilarious, Diane, and you are correct! LOL! My schedule for the day only has work, walk the dog, and lunch with a friend and I'm pooped just thinking about it. I can't imagine DG's action packed months on the road touring. Thanks for posting the pics you guys! these are great pictures! And of course being a southerner myself, I love the t shirt! !